Easyhit - the original and still the best by far. Do not be misled by cheaper imitations that make use of the Easyhit name in their adverts in order to imply, by association, that their product is just as good but lower in price. Yes, they are cheaper - and more flimsy in construction...and flimsy is not a desirable quality for a product that spends its life on the barrel of a high recoil shotgun! 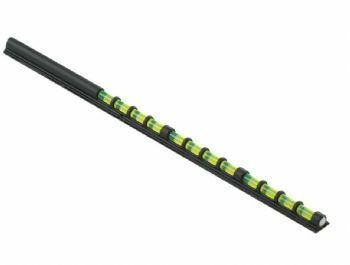 EasyHit Benefits "at a glance"
The longest length in the range and the most popular with Coaches who mount the bead temporarily using tape that covers one section of the fibre optic bead. 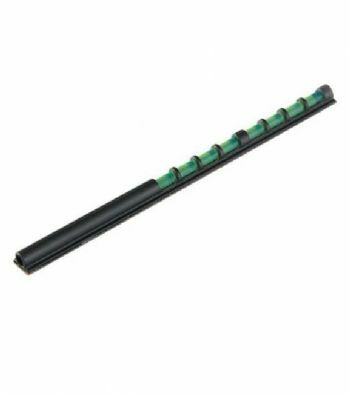 The bead's additional fibre optic length helps in low light conditions and is popular with wildfowlers. Also perfect for dusk and dawn aerial wing shots as the fiber will be glowing nicely with only a blue ribbon on the horizon. 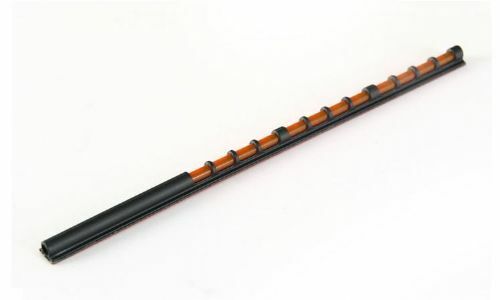 The EasyHit fibre optic foresight is contained within a specialist patented frame, butts up against the existing muzzle-end bead using a pre-fitted high bond, oil and heat resistant 3M self adhesive strip and is fitted easily for less that the cost of a driven pheasant. The brain combines the messages from the 2D images from the left and right eyes to create a virtual 3D image that we see when both eyes are open. This gives us the vital binocular vision to accurately judge distance. 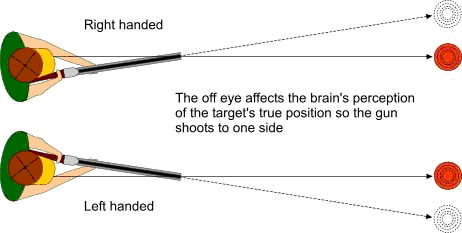 The brain, not our right or left handedness, decides which eye will have the main eye dominance which results in left, right or middle vision dominance - which, if not aligned to our choice of shoulder can seriously affect your shooting results. Simply put your eye and shoulder will be out of line and you won't shoot as straight as you should and you will get those shots that you'd swear should have hit but "just" didn't! The effect often goes unnoticed and you figure you're just not the best shot who ever lived, or you are advised to close an eye or put a patch over the eye - and thus lose binocular vision which is definitely sub-optimal. With eye dominance or middle vision problems eliminated, you can instantly shoot with both eyes open. 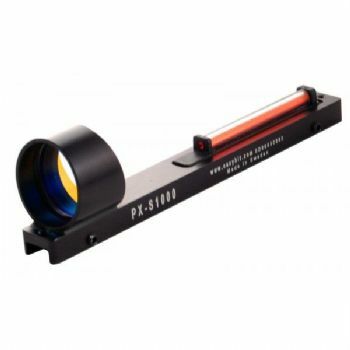 Peripheral vision now provides a safer view of the arc of fire. A perfect master eye provides accuracy. It is a common mistake to lift the head off the stock as a target is rising. the EasyHit hollow tube design is a quick indicator to tell you that you are doing this and get your head back down where it belongs. 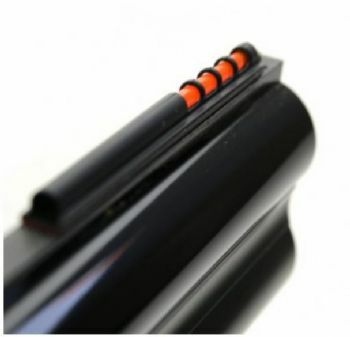 Fitting the Bead to any shotgun in less than two minutes instantly results in improved competition scores along with achieving the BASC "Respect for Quarry" code of practice objectives. 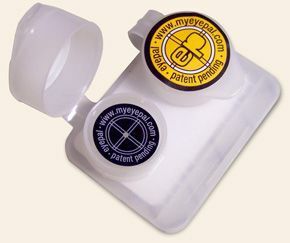 Glasses wearers - combine EasyHit with the Eyepal Peep hole system for better than ever before results. 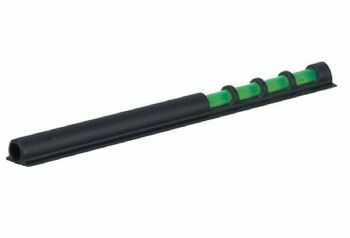 The Easy Hit fibre optic foresight is contained within a specialist patented frame, butts up against the existing muzzle-end bead using a pre-fitted high bond, oil and heat resistant 3M self adhesive strip and is fitted easily for less that the cost of a driven pheasant. What is the difference between the Green and the Red Bead? Both Green and Red Beads perform the same and correct eye dominance and more importantly 'Middle' or 'Central Vision'. The choice is therefore purely the choice of the customer though many clay shooters go for red and game for green. Simplistically. It works on the principle that your correct eye is presented with a fibre optic bead not dissimilar to any other bead but the wrong (cross-dominant) eye is prohibited from seeing it due to its patented design shielding it from view. Despite not looking at the bead the brain still registers the contrast in light between the rib view and the non rib view along the barrel and will always prefer the rib line of sight. The brain is constantly tricked into taking the easy option and the correct eye will always remain dominant despite looking at the target and long after you forget the bead is there, or you remove it, or use a gun without one fitted. Remember, it does not train the brain it tricks it! How does it attach to the rib? It uses a 3M self adhesive sticky tape to securely mount on your gun. 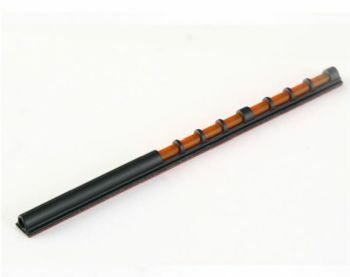 The tape has excellent features and can withstand high and low temperatures. Can I remove a EasyHit bead? The VHB tape has a foam core that you easily can cut through with a sharp knife. Peal of the residue with your nail, use a tooth pick to reach into the grooves of your rib. They are endless. Links open in new window so you will not lose this page. Dear Kurt, I have been competing for 10 years. After winning both the European and World Championships, I thought I had reached my highest level possible. But last May, Jean-Marc equipped my gun with a luminous foresight. I loved the new look but that was nothing compared to the results I obtained with it : Faster and more accurate sighting, Better control of the clay pigeon trajectory, Easier locating of the gun end, Faster aiming for double shots. I improved my results thanks to the EasyHit luminous foresight. I had several persons try it with always the same conclusions, this is truly unbelievable ! I also equipped the guns for loan at the Antibes Club where I work, and even the beginners find it more comfortable to shoot with. Using the EasyHit luminous foresight has brought me great satisfaction. Having tried all the other methods to solve my master eye problem I settled on the Easy-Hit foresight as it proved to be an absolute cure for my personal cross-dominant (master) eye problem and allowed full use of my peripheral vision. It may also be the cure for yours! I would recommend it to anyone who owns a shotgun. I have always been an accurate shooter with a shotgun as a hunter and trapshooter. But the EasyHit sight allowed me to do something I've never before done. I shot accurately with both eyes open. Just as the manufacturer claimed. I put the EasyHit on my 20 gauge and found a great improvement, this sight works very well in all conditions. Brightness in any light and fast and easy to pick up. Can't think of anything that could improve this product. I purchased my original Easy Hit fiber optic sight in an effort to correct a small gun mounting problem when trap shooting. I found the bright orange/red bead really stood out in all weather conditions, and I knew that as long as I could see a clean circle I had my gun mounted correctly. There is no doubt that the Easy Hit really improved my accuracy and it makes it so easy to accurately determine the spatial relationship of the barrel to the target. I was so impressed with the Easy Hit that I bought more, and they're used by my wife, two sons and my brother-in-law. If you want an inexpensive, easy to fit way to improve your shooting, then Easy Hit is the only way to go.